The model 8492 is an ideal choice where stainless steel is desired as the material of construction. It my be used on flammable gases other than those approved by UL providing the materials of construction are compatible. 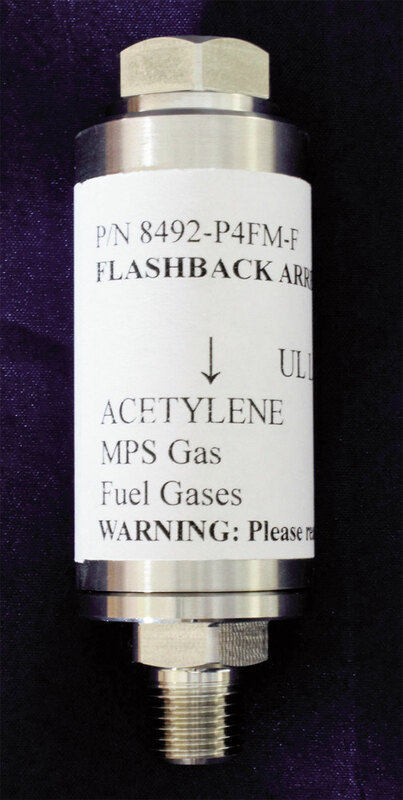 When installed in a line containing a flammable gas these units will prevent reverse flow, stop, and extinguish a flashback. The unit shuts off the flow of gas in the event of a flashback or reverse flow in excess of 7 psig. Re-setting is automatic when the down stream pressure is relieved. There is no need to open the gas line and no disassembly or special tools are required. May be used on compatible corrosive flammable gases. Reusable – can be reused after a flashback without opening the system or removing from service. Stainless steel flame barrier positively extinguishes flame within the housing. Checks reverse flow and provides positive shut-off of reverse flow over 7 psig. Built-in 100 micron filter on inlet.